Masala Junction is aptly named, straddling as it does the busy Hucknall and Mansfield Road’s in Carrington. It isn’t short of pedigree, the owner having formally had stewardship of the award-winning Memsaab. The building was Natwest bank previously and has since been transformed into a light, modern dining space. The menu is a good size; Indian restaurants, I find, can often be overwhelming in their depth of choice. 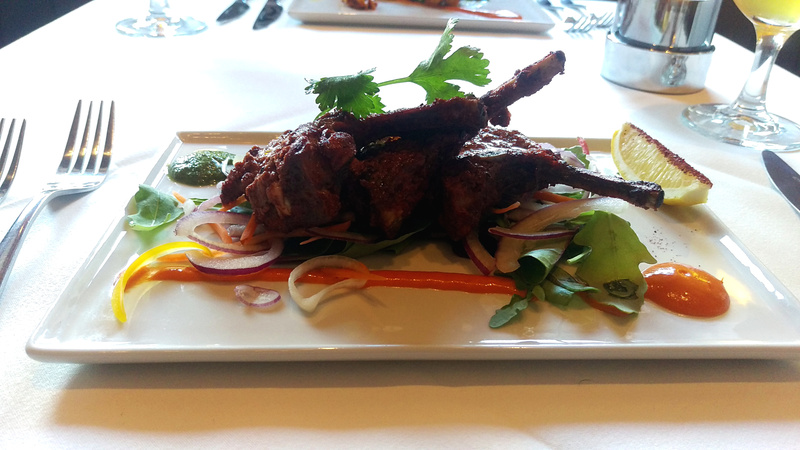 From the 9 starters I chose a ‘signature dish’ of lamb chops and my partner had Lahshuni Prawns. They both demonstrated the posh credentials of Masala Junction, embellishments and blobs of chutney on thin rectangles of plates. It didn’t really work for the rustic chops for me, though the prawn was the prettiest dish of the evening. It was also probably the best, succulent fat prawns with little charred edges from the charcoal grill. The lamb had a decent marinate, though I would have liked more spice and a little less cooking time on the meat. 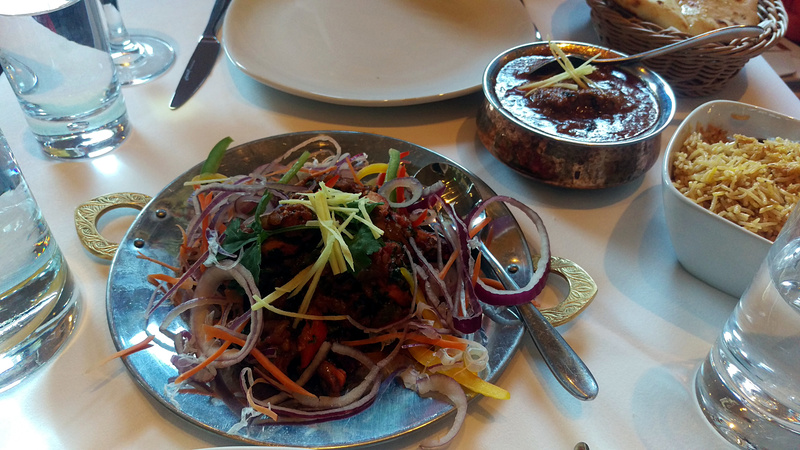 We tried to pick a couple of diverse mains and an unusual goat curry seemed to fit the bill. What arrived managed to look uninspiring but was pleasant enough, just lacking a spice of depth I expected from this rich meat. The goat itself was soft and slow cooked, though they should mention on the menu that it’s cooked on the bone as it might not be the thing for some people. In contrast to the dark gravy of the first curry a chicken Tika Tak was a fresher choice. Piling julienned vegetables on top of it was a questionable decision by the restaurant. As if to emphasise this what was hiding under the bucket load of raw onion was quite under whelming, it provided what I wanted against the goat but as a standalone dish I think I would have been disappointed. The core of the dish just didn’t have enough punch and flavour to complete with other good curries I have had in Nottingham, muted. Service was a little stretched on the evening we went, it was a midweek but became busy and they ended up a little stretched. I did enjoy their selection of beers, as well as the ubiquitous Cobra they had Jaipur IPA which is superior to most options in Indian restaurants. Despite its location Masala Junction is not cheap. Starters we had were £7.50 and mains £13-14, the same price as Memsaab and Calcutta Club at the premium end in the city centre. For a piece of real estate in a less salubrious area I expected my bill not to come to as much. When it is priced keenly and does stand out against its competition it has to go down as a disappointment, at the least I was hoping for something a little different. Why haven’t you reviewed the Laguna on Mount Street, that’s been in the same premises and (last time I checked) run by the same people, for about 40 years – I can’t think of another in Nottm with such long service. Sadly, their excellent Tandoori Mixed Grill is no longer (at last check) on the menu. A very valid question David, I will try and get around to it…shame about that mixed grill though!